As I noted in the previous post, I am excited to announce the publication of two articles today. This post deals with the second one. 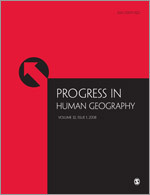 Progress in Human Geography, a widely-read journal where geographers publish reviews of current geographical research that point to new agendas for study, has published a piece that I contributed to them. It is available on OnlineFirst. It is titled ‘Grounded theologies: ‘religion’ and the ‘secular’ in human geography.‘ Again, I will post again when a print issue comes out. In many ways, this is my way of saying: ‘I found something.’ I began developing these ideas more fully after that introductory course, which then culminated into my master’s thesis on Chinese churches in Vancouver. As I began my doctoral work, I began to toy with the idea of ‘grounded theologies’ in my directed studies courses, and I finally wrote about it in my comprehensive examinations on geographies of religion, secularism, and social theory. That was when my supervisor, David Ley, encouraged me to develop this piece and put it into Progress in Human Geography, even as I was writing up my doctoral thesis proposal. The reviews came back as I was conducting field work for my doctoral project. To my pleasant surprise, the editors and the reviewers were not only supportive, but extremely thorough, profound, and constructive, advising me on how to maximize my arguments for the best possible impact on the field. I then revised the paper, foregrounding the notion of ‘grounded theologies’ in human geography. The paper is basically about how geographers should study ‘religion’ and the ‘secular.’ I began by engaging the work of Lily Kong, a cultural geographer and the Vice President at the National University of Singapore, who had suggested that geographers need to define what ‘religion’ is and is not. I am an admirer of Lily’s work, as she has recently opened up many possibilities for us to study religion in geography. I was also struck by her corollary call to engage theology and religious studies more deeply. Engaging this literature, I found that ‘religion’ and the ‘secular’ are very contested terms and that to define what religion is and is not would reinforce the binary idea that some spaces are religious and others aren’t. The alternative path proposed in the piece is that of grounded theologies, ‘performative practices of place-making informed by understandings of the transcendent’ (p. 2). While there has been a growing literature in geography on the possibilities of ‘post-secularism’ (in fact, Paul Cloke and Justin Beaumont have a piece on this in the most recent print issue of Progress), there have also been some complaints that this literature doesn’t take seriously what secularization actually means (especially by Justin Wilford, also in Progress). I propose that the way forward is to see ‘the secular’ as much as a grounded theology as ‘religion.’ After reviewing the relevant literature on ‘religion’ and the ‘secular’ in theology and religious studies, I demonstrate how this concept has already been put into practice by social, cultural, and political geographers. In doing so, I had to engage with what is known as the ‘canon’ in religious studies (e.g. the foundational work of social scientists like Emile Durkheim, Max Weber, William James, and Clifford Geertz), formative debates among religion scholars about what ‘religion’ is (e.g. a critical juxtaposition of the work of Mircea Eliade and Wilfred Cantwell Smith, as well as more recent work by Jonathan Z. Smith), and the recent critical conversation on secularization that blurs the lines between theology and religious studies (e.g. the work of John Milbank, William T. Cavanaugh, Talal Asad, Judith Butler, Saba Mahmood, Brad Gregory, and Charles Taylor). I then put this literature to work by looking at how geographers have already been engaging to some degree with grounded theologies as they undertook studies of how different religious subjects understood their identities by intersecting their social spaces. I also looked at recent discussions in critical geopolitics surrounding religion, especially as geographers have been interested in the eschatological dimensions of religious engagements with the public sphere. My hope for this paper is that it will open avenues for geographers to research ‘religion’ and the ‘secular,’ as well as engage with scholars in theology and religious studies. Moreover, my aim has been to critique the notion that ‘religion’ and the ‘secular’ are mutually exclusive. By doing this, we might be able to show ironically how people conventionally labeled ‘religious’ sometimes employ ‘secular’ ways of making place while people who call themselves ‘secular’ are guided by implicit theological narratives in their geographical practices. I’d really like to thank David Ley for guiding me through this process, as well as the editors of Progress in Human Geography who oversaw this publication, Noel Castree and Anssi Paasi. The five anonymous reviewers who critically turned over every part of this piece have greatly strengthened this paper; I also feel extremely humbled that they have taken my work so seriously and have engaged it with such profound insights. Claire Dwyer, with whom I am working concretely on a project dealing with grounded theologies in Richmond, British Columbia’s ‘Highway to Heaven,’ has also been very encouraging. My friends, Robert Edwards and Carl Hildebrand, also read the piece and offered very constructive thoughts. I am very thankful that this piece is out, and I look forward to engaging fellow students of ‘religion’ and the ‘secular’ on how these concepts describe grounded theologies put to work in the making and contestation of real places in the world.